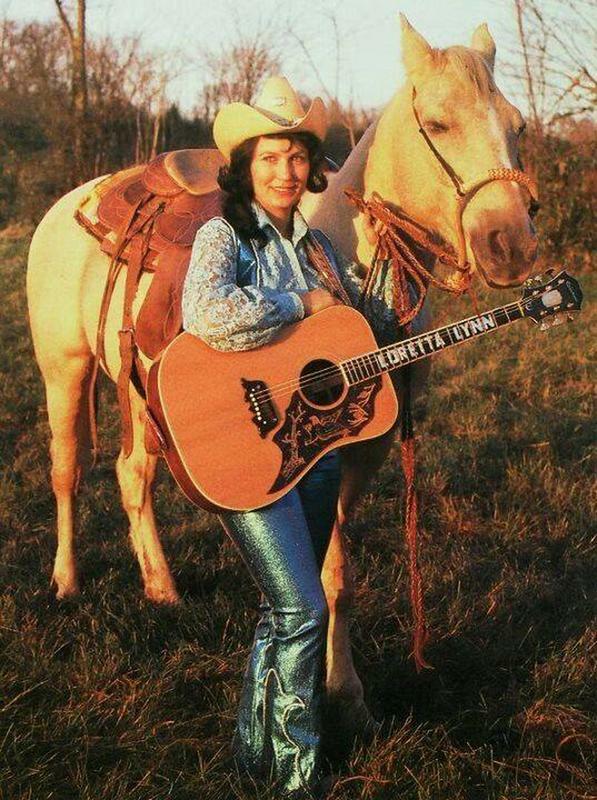 A great shot of Loretta Lynn with her golden brown acoustic guitar and her golden palomino back in the day. Loretta Lynn is the all-time most successful female recording artist in country music, with 24 chart-topping singles and 11 number-one albums to her name. The Academy of Country Music named her "artist of the decade" for the 1970s, she's been inducted into every conceivable hall of fame, and she is a Kennedy Center honoree. Her best-known tune is the autobiographical and sentimental "Coal Miner's Daughter," released in 1970, but Lynn made her name with feisty, rebellious songs that often carried messages of rebellious empowerment if not outright feminism. The songs "You Ain't Woman Enough (to Take My Man)" and "Fist City" are addressed to man-stealing women, while "Rated 'X'" and "The Pill" discuss, respectively, double standards in male-female relationships and birth control.